Emu Plains to Katoomba: The gods aren’t the only ones that are crazy. Why would you ride a bicycle up from Emu Plains to Katoomba? From close to sea level to over 1000 metres? Why would you set off with a prediction of rain at over 80%, with pelting rain the night before, clouds close and threatening? I don’t know why anyone else did, I don’t know why I did, but I’m glad I did and I’m glad my companions did. The trip was meticulously planned, as usual, by our leader Grant Rogers. 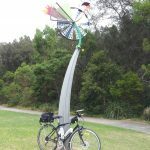 We were to catch train the express train at time 7.35, unless you were to join the trip at the higher point of Springwood station, saving 350 metres of climbing and 13 kilometers of cycling. The accommodation at the YHA had been booked, ensuite or not, dorm, or if you preferred, pub accommodation. The RSL had been booked for you optional evening meal. Grant had even gone to the trouble of prepping a ride he knew really well, making sure the bushfires had not affected any of the streets we were to take. 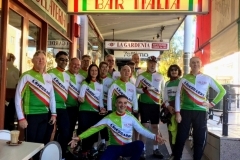 When I write that Grant knew the ride really well, it is because he confided to me that in training for the 250 kilometre Audax ride in Bright http://www.alpineclassic.com.au/, he had ridden up and back to Katoomba twice in one day. So man proposes and nature disposes. We are not omnipotent in fulfilling our desires. We are not perfect beings. Grant got on the wrong train, the suburban one to Penrith that left at nearly the same time as the correct intercity one. Patsy and Steve caught the same mistaken train. “Old Bathurst Road seems very busy,” one of us voiced a concern. Sometimes strong individual opinions backed up by the desire to take direct action overrules the will for collective action. “I’ll ride on ahead and see where this comes out,” said Richard. We next saw him at Springwood, then again saying farewell at Katoomba. Meanwhile Grant had somehow decided to cycle up from Emu Plains, or was it Penrith, and would catch us up instead of taking the train to Springwood. 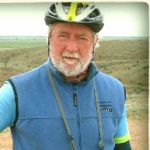 His route was different to the Old Bathurst Road, taking the Great Western Highway to the start of Mitchell’s Pass, then the short bike track to the old Knapsack Viaduct Bridge, then again along the M4, and then ducking through Glenbrook. Patsy and Steve continued the wrong way up Mitchel’s Pass. The bulk of the leaderless rabble, actually we were not leaderless the problem was a surfeit of leaders, ploughed up old Bathurst Road, climbing so steeply most of us had to get off our bikes and walk. Despite this, we surprised ourselves by arriving at Blaxland in short order. We met up with those how had chosen to start at Springwood. The coffee shop selling sourdough bread smelt great, but the clouds grew darker and more menacing. Drops of rain could only be ignored for so long. Grant told us by phone to go on, not to wait. Bruce and Libby and Sue were going to go up and back in a day. From Springwood, through Faulconbridge and the Corridor of Oaks, and then once more on the verge of the highway we pressed on, before the rain really came down. Out came the slicks, off with the shoes on on with the sandals. Mick Saunders found a covered picnic shelter where we huddled. Richard sat in the bus shelter across the road. I collected rain water streaming from the roof into my water bottle, a bit concerned about bird droppings and dead animal carcasses. We mused over the chances of weather. John Ross told me stories of how Bob Moore could identify unusual clouds. Sure enough, the rain eased. We pressed on, sometimes a small shower, nothing like the first downpour. Most of us discarded the rain gear as too hot anyway, and took on a bit of warm dampness. Lawson for lunch, and finally Grant, Patsy and Steve caught up. They had ridden right through the worst of the rain, their shoes and gloves were really soaking. We didn’t want to wait for Grant’s party to have lunch, so the rest pressed on. Once again with so many leaderless leaders, we broke into groups that took separate courses. Some had stops in Wentworth Falls, some took the Cliff Drive from Leura onto Echo Point before Katoomba. Some were at the pub before the YHA, some had changed first. No matter, the garden at the pub was a welcome spot, and once again real life was reviewed. Perhaps that is why we ride our bikes in such circumstances? To step outside our normal lives, place them under curious scrutiny, find them interesting, bizarre and perhaps distant. Having visited them like tourists, the Echo Point of a surreal personal landscape, we can plunge back in with more equanimity. The odd beer or cider helps too. The RSL that night, with a pleasant tiredness, then early to bed. The next day Steve found he had a puncture that wouldn’t fix. He and Patsy bailed. Bob Moore joined us, but took the more direct way down the highway, to meet us at Wentworth Falls Lake. We amused ourselves with stories about how every ride should be equipped with chalk, so we could scribble messages to each other. It was good to meet up with Bob, chat and recount tales. We rode on down to Lawson, where Bob left us again to follow the bike track out of Lawson, to see how far it went. We followed the tried and true back streets to Hazelbrook and Woodford. We had already had a taste of these streets coming into Lawson. Although the trend is downhill, these are all undulating roads. Fortunately, the downhills were such that you could get enough speed up to almost coast to the top of the next rise. 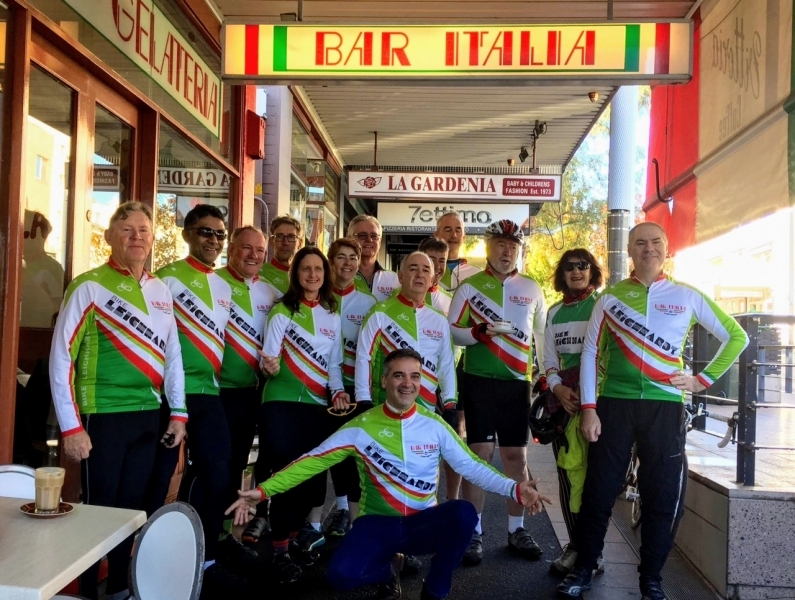 It was really only around Leura that we had to pedal with great effort. We bought our lunch in Springwood, to be eaten at the Lennox Bridge site. We lingered there, and Bob caught us up. Finally, the long wait for the intercity train, with carriages unsuitable for groups of cyclists. The weekend was over, the thoughts of the next ride ahead. For some of us, small thoughts of how we should change our lives, but not too much, nor too sudden. Thanks Grant. Thanks fellow riders. Excellent bit of Zen and the Art of Cycling there, Jamie. I enjoyed my somewhat solo ride, sorry if I kept you waiting at the Lennox bridge. Still trying to figure out how you all passed me without me seeing. Can report there is a good shared path next to the highway between Lawson and Hazelbrook, and looks like it will soon be open as far as Woodford. There is a new on road bike shoulder as well. So may be no need to deviate down Baths Rd in the future. The narrow shoulder past the fruit shop coming down to Faulconbridge needs fixing, and I took some photos to send to the RMS. Also there is a bad bit just east of Leura. Why they can’t fix these problems while spending mega bucks on the new sections I don’t know. Bob the cycle lanes sound like a grand idea I hope they all get to link up.